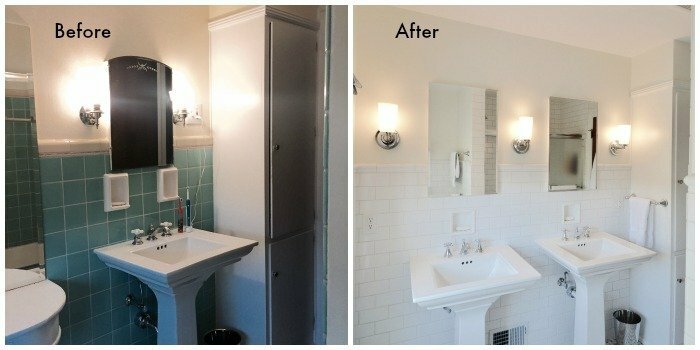 When you’re working with a small space it can be hard to envision a transformation. Can you really open up an area that feels cramped without tearing out walls and doing a major renovation? In a recent bathroom remodel, we were able to do just that. This home was originally built in 1939 and the homeowners wanted to restore its original charm. We were able to not only do that but also open up the space and make it more functional. 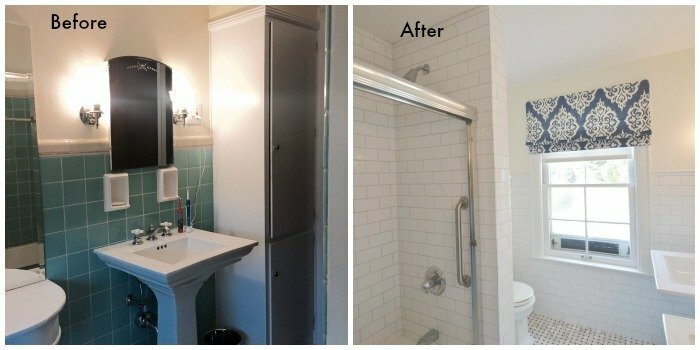 The biggest change we made to this bathroom was replacing the dated blue tile on the walls. This tile made the room feel very dark, and as a result, very small. 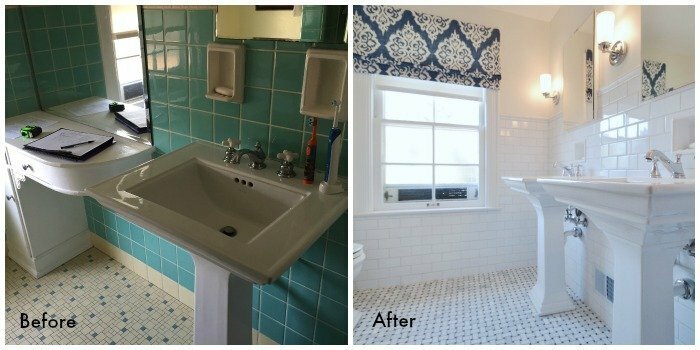 We made it brighter and more current by replacing the blue tile with classic 3×6 white subway tile. We carried this tile throughout the bathroom, including into the shower. Another major design details that we updated was the flooring. We installed a marble basket weave design, which could have been something you would have seen when the house was originally built. The black and white color palette blended well with the rest of the home, which was more traditional. Another big update was replacing the awkward corner vanity with a second sink. We used a Kohler pedasal sink which was a style from the original design. . Pedastal sinks creat the illusion of more room and the chrome fixtures provide a nice pop against the white porcelain. Are there places in your home that are dated, cramped, or cold? We’d love to help you transform them into something you love coming home to. Walk through these four easy steps to start your project, or use our handy budget calculator to plan your remodel. A total transformation is easier than you think!